Who knows if anyone these days is still subscribed to this blog? But at any rate, this post is to say that I hope to resume posting, after a half year hiatus. I’m back in the States, having wrapped up my fieldwork in Paris a couple of weeks ago. At least, it’s wrapped up for the time being. I have plans to go back to France in 2012-13, and I already suspect that some further interviews will need doing. As I left for the airport we drove over the train tracks. 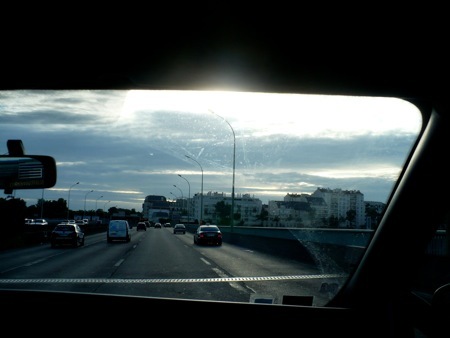 I was in a van driven by an Algerian born in Paris (that was his self-description). His cousin turned out to teach at the University of Paris-8, my fieldsite, which reminded me that even a physically vast metropolis can be a socially small world. Do you want his contact info? he asked me. I don’t know, does he have strong feelings about campus politics? I said. I don’t know, we only talk about technology, said my driver. Formerly he had been a middle school (collège) technology teacher, but having not found work he’d decided to switch to the transportation business. The sunshine dodged through the clouds in shades and patches. 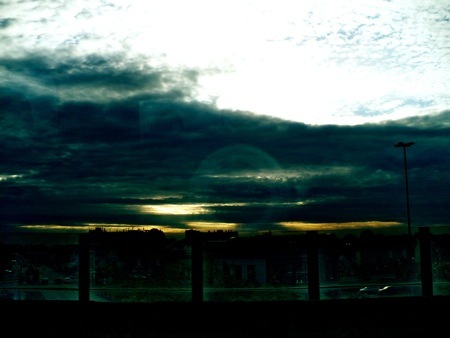 (My photograph was horrendously overexposed, so I had to process it to show the light.) 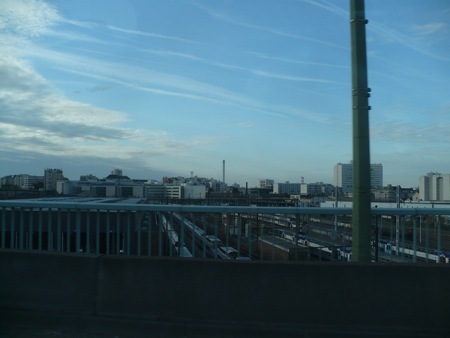 Paris banlieue passing like the silhouette of a gigantic rockpile of chimneys and brickframes. Striking how little you ever need to see the highway if you live in Paris, striking how total the dependence on public transit can be. You realize when you leave that you haven’t seen the inside of a car for months at a stretch. We passed a car accident as we drove. The driver said he’d seen countless accidents. No longer felt any horror or surprise at the sight. See one every day, if you drive for a living. How has Paris changed in your lifetime, I asked? Well, it used to be socially mixed (mélangé), he said. People from different social classes lived there. Now it’s only the rich. The working class pushed out to the banlieue. Finally we got to the airport and we shook hands and I told him it was good talking to him. He gave me his card, hoping, no doubt, that I would hire him again on future visits. But here’s a bit of market irony for you: his rate was much higher than his competitors’ (50€ instead of 30€); I only called his company because all the cheaper ones were full; and the very practices of economic rationalization that he advocated, on a national level, will probably preclude me from hiring him again in the future. Anthropologists, too, can practice market logic… at least if by market logic you mean trying to stretch your limited resources as far as possible! Happy to see this blog coming back to life ! Glad to hear from all three of you!